Happy Father’s Day Weekend! I’m working on a Black Forest Cake, but it’s one of those things you have to build in steps and will not be done until this evening. So for now, here’s a cookie recipe. It’s called Jessica’s Marshmallow Clouds. I don’t know who Jessica is, but I think she might be one of Mrs. Fields’ kids since the recipe is from Mrs. Fields. These were easy to make and baked up big, fat, soft, and chewy. The trick (as I found out) is to seal the marshmallows in the dough, otherwise, the cookies will burst open in the oven and the marshmallows will over-cook and get too sticky. It’s a good idea to use parchment or non-stick foil when making these, as they are sticky. Preheat oven to 350 degree F. Line a couple of cookie sheets with parchment. Mix flour, baking soda, salt and cocoa powder together in a medium bowl. Set aside. Cream butter and both sugars. Beat in eggs and vanilla. Add flour mixture to butter mixture and stir until blended. When ready to bake, mix in the chocolate chips. Hold 4 or 5 frozen marshmallows in the palm of your hand. Scoop batter up by generously rounded tablespoonfuls and mold around marshmallows, covering marshmallows the best you can. Hi Greg! I love adding marshmallows to things, but it’s easy to overcook them. To be honest, I don’t think they’d hold up very well in cupcakes even if you froze them. I’m not sure which S’mores cupcake recipe you are using, but I kind of like the ones that have a graham cracker flavored cake, some chocolate in the middle, and a toasted marshmallow frosting. Hi i have a question maybe you can help me out. I’ve been doing some research on Marshamallows, adding them to cupcakes! Im making S’mores cupcakes for a dear friend soon and was concerned about adding them but reading about how you froze the mini marshmallows for your cookie dough sounds glorious!! Do you think that is what I should do for my cupcakes? I only plan on adding about 3 or 4 with a piece of chocolate in the middle. Any tips or advice would be greatly welcomed. I thank you ! When I was a child in the 60s, my mother made a chocolate cookie wrapped around mini marshmallows (no chips). The molded cookies were rolled in sugar, too. They were wonderful. Years passed, my mother stopped baking for many years. While she now (in her 80’s) bakes again, she has lost this recipe. We have tried to recreate it, but without success. Does anyone remember this recipe? My family has made these cookies for years! They are amazing. Follow Jenny’s notes about freezing the marshmallows and keeping the dough in the fridge and you’ll never go wrong! I found it really helps to use at least 3 cookie sheets so you can constantly rotate the sheets as you keep forming the dough/marshmallow balls. Enjoy! I (finally) made these over the weekend, and it took a little work to get them right. Even if I wrapped the dough around the marshmallows, I had significant trouble with the marshmallows bursting out of the dough anyway. So, I reduced the number of marshmallows from 5 to 4 per cookie, and increased the amount of dough per cookie. Most of them turned out okay after this adjustment. You really have to make sure there is thick enough dough evenly covering the marshmallow filling. Even so, a couple of these looked a little strange – it isn’t a failsafe recipe. But they taste great! Yum! I made cookies stuffed with mini marshmallows once and they were great. Thanks for reminding me that these cookies exist! 🙂 Yours look awesome! Oh, these sound right up my alley…I can’t wait to get my kitchen back so I can bake these! I am happy to hear you tried these and liked them. 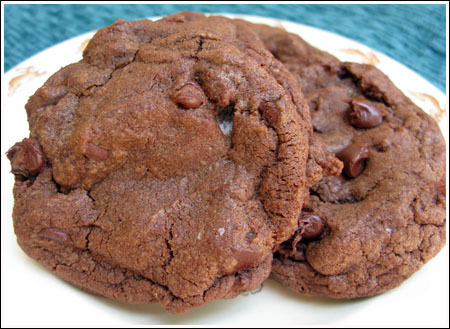 There are lots of chocolate cookie recipes out there. What I liked about this one was how puffy and light they were and of course, the marshmallows! I made these cookies this evening and they are really good. I only got 36 cookies out of this recipe, so I made them a little large. It really did help to freeze the marshmallows. Good tip! I also kept the dough in the fridge between baking and the firmer dough was easy to wrap around the marshmallow. Thanks for the recipe! I assume the recipe calls for normal unsweetened cocoa vs. dutch processed since it uses baking soda, correct? Hershey’s unsweetened cocoa will fit the bill? These sound great! I’ve never heard of putting marshmallows inside a cookie, but what a great idea. When my daughter was younger we used to make these from time to time. It was one of her favorites. I think she liked putting those frozen mini marshamallows inside the dough. I should make them the next time she comes home! Your Black Forest Cake looks WONDERFUL!!! What a treat that must have been. The picture of Lizzie getting her bath is precious. It really puts into perspective how little she is, even though I’m sure she has been growing rapidly! Oh, I bet these are yummy! I am intrigued by this recipe, I have always been scared adding marshmallows to cookies and the mess that may ensue due to explosion while baking! ha ha. They look great!